I have no problem walking my Husky off-leash. I can't walk my off-leash, he'll/she'll run off. My Husky behaves well while home alone and does not require kennel. My Husky has to be kenneled or he'll/she'll tear the house apart. My Husky doesn't dig out from under, or jump over my 4' fence. My Husky digs under and/or jumps over my fence. Hello All, I'm new to the forum and here to determine if a Husky is for me. I'm pushing 60 and have had various larger dogs throughout my entire life. I'm interested in possibly getting a Husky pup, but have read a few trait issues that may be deal breakers. 1) Is that I live in the mountains in So-Cal and have miles of forest where we can walk. I wouldn't want to have to keep the dog on a leash to do this. 2) I have a doggy door going into my back yard and I'd want the dog to have it's freedom and not be kenneled/caged in my home. She would be with me all day at work and all night at home. Only occasionally left alone. 3) I have a 4' chain-link fence surrounding my property that I wouldn't want to heighten. I just wouldn't want the property looking like a compound. So I thought I'd post a poll thread to see the percentages of you Husky owners in learning your personal experiences with such issues. I'd really appreciate your participation. I would love to answer your poll questions, but in reality most don't apply to my situation. Every husky is different in personality as well as how well they are trained. I can certainly answer your questions as pertained to me as well as my neighbor who has a husky, but every situation deserves a response as to the hows and whys......if you would like me to answer your poll questions in the form of a post I would love to help you.....let me know. if you would like me to answer your poll questions in the form of a post I would love to help you.....let me know. Thank you, and yes, I'd love to hear what you have to say. Great..... #1 - my husky walks off leash with me, however I did extensive training with an e-collar, never trust a husky, they will take off if not trained. My neighbor's husky must be leashed, since he wasn't trained in any capacity. So yes you can walk off leash, but I suggest having a professional help in training with an e-collar so you know how to properly use it. I do not know of anyone on this site that will walk off leash without the use of an e-collar(it is somewhat a controversial issue). #2 - I did not crate train, however I believe that is a must with a young husky, or like myself the rare occasion, I put my girl in our work shop, I doggy proof and leave her treats, and this is after extensive exercising. She is 2 years old. I recommend crate training and use of a crate for young huskies when left alone, for their safety as well as your house. As they age, some do mellow out and can be trusted. I try to emphasize to new people that crates are not a punishment, most huskies need a "den" that is theirs, a quiet place. My neighbors crate their 3 year old husky. This leads to question 3, since you mentioned doggy door. I rarely leave my girl alone, and typically it's a few times a year for 2-3 hours max. #3 - I do not have a fence at all, if she's out, one of us is out with her. My neighbors do have a 4 or 5 foot fence in their front yard, because he is out their when they are home he has never tried to go over nor tried to dig under. However, they do have an enormous crate/kennel in the back yard for when they go to work, because he is an escape artist, they had to put a roof on top, and cement the bottom, because he would climb over and dig under. A lot of this is personality, my girl is well exercised, my neighbors is not, he will try and run every chance he gets. Miya wants to be with her people, I'm outside to ensure she will not take off after a small animal, through our e-collar training I do have 95% (please see this, I am saying I am not 100%) confidence she will not take off, especially if I had to warn her. There are some folks here who are successful with an e-fence. My best suggestion is to use the search function and read some threads on the off leash issue, e-collar, and e-fence. Ask as many questions that come to mind. My life is drastically different for having a husky, she is my best friend, and to me the greatest breed and dog ever. They are not the easiest, but if they have a fulfilling life they will give you a fulfilling life.....I'd be happy to answer any other questions. My experience? My first husky, 40 years ago, I used to let off-leash, was only on-leash if we went for a walk. We did not use tie outs. She went "walk-about" on several occasions - once gone for 3 tortuous days. Someone took her in while they tried to locate the owner (me) and she liked it there She was also hit by a car once and broke her leg. She killed my cat (trying to play). This was back in the day when dogs were allowed to roam the neighborhood, crating was not for the average Joe. My current boy? Was adopted at about 12 months old. Untrained. Was either crated or on 100' trolley unless loose in an out building with me for playtime at first. Graduated to loose in the backyard 4' chain link with me outside with him. Then, loose in the back yard with me in the house, watching. He (and his "nephew" - son's dog) now are contained on about 4 acres with an invisible fence. Walking off the property is STILL on-leash - even though we live on a country road with very little traffic, what cars we do have, drive fast. And I have had 1 dog get hit with injuries, my neighbor had a dog killed by a car and my Mom, in Maine, had her standard poodle leap her fence chasing a cat - the one and only time, get killed by a truck. I am working on e-collar training for off-leash walking but we are not there yet (and training has gone by the wayside with the deep snow and cold, myu bad.) I do not know if I will ever trust him off leash - I am older and wiser now and too much aware of the dangers. Well, your poll isn't doing too well; I think most of us have two (or more) dogs so it's hard to say that this dog will and that dog won't in a poll like yours. So, like Amy and Renee, I'll give you my experiences after a short intro. I'm 68 and, like you, have had large dogs most of my life. Labs and GSD's with the occasional spaniel tossed into the mix. Somewhat like you, I live in a remote area - in my case it's the desert just outside the gates of Big Bend National Park in south west Texas (where I'm freezing this morning, it's 27f which for me is just plain cold!). Just to give you some perspective, we have roughly 2,000 people living in an area the size of Delaware (the county in which I live is 5 times the size of Delaware!) so there's not a whole lot down here except room. There's also a thread on here Where's Al Live? that'll give you some idea of the free range I'm talking about. I now have two, an Alaskan Husky - Avalanche - and a shaggy Siberian - Sasha. Both rescues and both a little over 1 year old when I got them. I trust neither of them off leash unless I'm right there. Avalanche likes to run and I know he'll just go until he drops; Sasha might come back if she were loose, but I'm putting no trust in that. Avalanche gets runs with me, he's loose on the road and I'm in the Jeep behind him. Generally he stays to the road with the occasional run into the scrub after a rabbit<?> but he's never brought one back. Sasha and I go for walks across the desert and once I'm away from the neighbors - across the road from me with three terriers who Sasha has an interest in - I'll let her run off lead now. We've worked on this for the roughly three years I've had her and she'll come when I call but also seldom gets more than a few hundred feet away from me. With those very few exceptions, it's safe to say that when either of them want out they're on lead. Avalanche like to play in the front "yard" and he's on a 30 foot lead, has a "Jolly Ball" that is his favourite outside play toy. Sasha is on a 100 foot lead out back (yes, they can get together to play but seldom do), she's seemingly more comfortable being inside with me than outside. Inside mine have the run of the two/three rooms of this trailer that I live in. The back part is closed off since they decided that it was a good place to "do their duty" - I guess the feeling was that if it wasn't actively being used it wasn't a pert of the house so it was available<?? ?> The two of the do play inside, kitchen to front bedroom and back until dad gets tired of it and says "enough"! When either or both of them aren't with me Avalanche is normally outside on lead when I'm gone; Sasha has run of the house. I've had the good fortune of having very little chewed (a pair of blue jeans got destroyed by Avalanche!) or otherwise destroyed and both have run of the house at night. I don't even own a crate. Would I give another Husky free reign - not on your life - once was enough, we learned the hard way. With good training would I allow them off lead with me present, yes, as I've indicated I do. When others are around they do not get off lead ... (others being people who own property here but only come in from time to time). As everyone has said so far, each dog is different. You'd need to take the time to see if yours is one who will "run until he drops" or one who'll stay close ... your fence, as Amy said, might be sufficient. Sasha was held on a property that had a short fence and stayed inside it, Avalanche can clear a five foot fence with no problem and will! And, finally, welcome to the forum. It's good to know that you're seriously looking at the ups and downs of being a Husky owner, they're a great breed but they can also be a major headache. And as for me, I would not be too enthusiastic about house training a puppy at my age! Good luck and let us know what you do --- and of course, pictures when you do. It seems like you have done some research that is telling you that common breed traits may not work for your life style. Are there exceptions? Yes, absolutely, however, as always, you should prepare to do all the things you don't want to do with a husky, they tend to be very demanding, and you can't expect one to adapt to you. May I ask, what is attracting you to the breed? What is it about the husky that makes you want to bring one into your life? It sounds like you will be spending a lot of time with your dog, which is great. But, if you are opposed to crates for whatever reason, your dog will be MORE likely to develop separation anxiety issues when you leave given that you will be spending so much time with the dog. Just something to think about. Having a Husky alone in the house to roam free, especially during the first two years, is asking for trouble and setting yourself up for a lot of frustration and setting your dog up for failure. Just something to think about with your opposition to crate training. They are not the sit around and look out for the property type of dogs, at all. As Jen said, there are no guarantees, every dog is different. Some train fine and others with the exact same training will never be off leash dogs. Honestly, if those things are truly deal breakers and you would get rid of a dog that starts to contradict those qualities, do not get a husky. You're probably better off with a Lab or a Shepherd. We crate trained. Started giving our boy free roam around a year and never had any issues with that. We used to live in a rental house with a 4' chain link that we were at for the first 2 years of Bode's life. We never had any issues with him jumping or climbing the fence. He did however get out a couple times through "weak" spots in the fence when he was a puppy. The key is just not leaving them outside unattended for long periods of time. We have done some off leash training. He does ok. Usually we use a 50 nylon rope and let him go that way we could catch him if needed. However, I don't think I'm comfortable letting him totally off in the mountains, etc...It's just not worth the risk to me. Having my dog be safe and with me is more important that having a dog that is off leash occasionally. That's an interesting take Sara and definitely relevant information for the OP to consider. I would personally never prescribe someone to avoid breed X outright considering that someone's goals; I'm very wary of breed being framed as fate. I imagine going to a well respected, highly skilled trainer and that trainer saying "I'm sorry, I can't train that in your dog due to breed." That just doesn't compute for me. But, undoubtedly, breed does present training challenges that will manifest themselves in various ways in various circumstances and when I read the OP's initial post about the characteristics desired in a dog I immediately thought that a gun dog/sporting dog would be best suited to fill that role. Having a Husky as the dog the OP has described will take double, maybe triple the amount of time and effort and will absolutely require the use of a serious training protocol involving an e-collar as compared to what would be the required with a sporting dog, herding dog, or gun dog. Agreed Jeff, thanks for being so eloquent. I was thinking similar thoughts, but couldn't manifest them. All I'm trying to say is those are some pretty serious dealbreakers and sometimes training just can't (or is extremely difficult to) curb certain behaviors, especially when a breed's foundation predilects them to those behaviors. It's a tough thing to settle when the dog we want is not the breed we want. I had to deal with that dilemma quite seriously with Link. I didn't "vote" in the poll as even with my one individual dog, I found certain scenarios applied at some stages of his life but not in others. Things could go either way for every line in the poll. I would have to take things line by line for my ONE individual dog and as others pointed out, every dog is different. The above two are absolutes and depending on the situation I cannot say either absolutely with my dog. I will say I do not trust my dog off lead and never ever walk him off lead because I know he'll take off if given the opportunity. However I have also worked hard to train a solid recall for such events where my dog might get loose accidentally which has happened. Most times his recall is pretty solid, but there has been the rare occasion where the desire to run has trumped his recall and I've had to hop in the car and track him down. These two have also depended on what stage of life he's been in and training. When he was younger he needed to be crated to keep from destruction. Later in life he was trustworthy and was fine being left with full run of the house. Then even later in life he started deciding not to hold his bladder/bowel movements when left loose and we've had to go back to keeping him confined to a smaller area to keep from having accidents when left unattended. Again, this one depends on the situation. My sibe would dig out from under a fence if left unattended for long periods. My sibe also would have jumped a 4 ft fence when he was younger if left unsupervised and the right stimulus was on the other side of the fence. Now that my sibe is a senior with arthritis I am 95% sure he will not jump a 4 ft fence. So far we have been lucky as we have been living with a 4 ft fence for the past 8 months and he hasn't tried to jump it. Now, considering the scenarios you've presented regarding your living situation, I will offer how I would handle them with my particular sibe (knowing his tendencies, etc). I wouldn't trust my dog despite his excellent recall. For hikes in the wilderness where I want my dog to have the ability to roam I just take him on a long training leash. He gets to roam safely and I never have to worry about him taking off on me. I'd trust my dog with a doggy door when I am around and able to peek out the window to make sure nothing out of the ordinary is going on. I would not allow my dog to go in and out when I am not home, too much could go wrong and I would have no peace of mind. At least when I am home I can take action if something is up...like if he suddenly decides to start digging along the fence line and I have to run out and stop him (unfortunately, he's been doing this frequently these days). When my dog was younger (in his prime) I would never have trusted him but these days I do since he's getting up there in years and no longer shows any desire to jump a fence. When he was younger he would attempt to jump a 6 foot fence, now he doesn't even attempt a 4 foot fence. So many factors will go into how a given dog will be in any situation, I am merely sharing how mine would behave given his background, personality, energy level, stubbornness, training, health and age. Leaving in the house uncrated: My first pup totally destroyed our student apartment - tore of all the wallpaper, regularly trashed the garbage can, the toilet paper, dug mammoth holes in the couch, peed on our bed...that's off the top of my head. Ami? He is not left in the house unattended because of above experience with his predecessor, however, when we are home - never had a problem with him. No peeing, no marking indoors, no chewing what should not be chewed. BUT, when he's inside, it's because he's zonked - he prefers outside. Not only this, but it will also require constant training throughout a dog's life. I never imagine Dizzy getting to a point where I can think, 'okay, all good there.' He is always going to push boundaries and be a 'creative problem solver.' My first husky Tasha, well, lets just say she fit all of the negative breed traits. Until she was 15. And she passed away 2 days after her 15th birthday. Honestly though, there really is no dog like a husky, and once one woos and chews its way into your heart, it's hard to imagine having another breed when it comes down to it. Although, there are moments where I wonder why I didn't get a german shepherd. Thank you all very much for the insight you offer. This is exactly what I'm looking for. I feel that I do have a huge advantage in raising a dog being that I'm able to spend 95% of my time with the pup. I suspect that even a (more challenging to train) Husky I can be managed with proper training and extra efforts. I've worked with difficult pups in the past that later groomed into being very well behaved companions. I've read a lot about the Husky's trait issues and a lot of them read like they're "carved in stone" with no exceptions. I found that a little hard to believe to be honest. Of course that's all based on my past experiences of never having a dog that needed to be kept on leash for example. I've also never had to rehome a dog and don't expect to ever need to do so. Which is why I'm here trying to determine whether a Husky would be a suitable companion to me. My interest in the Husky is simply that they impress me as being beautiful, friendly, loving companions. A German Sheppard is really of no interest to me, nor is a Lab, etc. However a Husky has always been of interest to me. I also have to consider that at my age, this may likely be my last dog. I therefore decided to at least look into the possibility of sharing my time with a Husky. Thanks again all, and please do continue to express your opinions and experiences. Whether they're positive or negative, all will be taken into consideration. I'll keep searching past threads for more information as well. I got Ami at age 62 - I find the siberian husky to be a most engaging, friendly dog - their supposedly difficult traits are what attract me to them. Impudent whelps, independent (sort of, mine have always liked to keep me in their orbit, if not exactly right next to me.) I absolutely love their woo-woo talk back, their playful antics, their insatiable curiosity, they are smart as a whip as far as I am concerned. Their "watch me" attitude when you tell them "no". Keeps me hoppin' and my mind busy! Basically, I see my job in owning this breed as "keep them safe as they enjoy the world." Watching them, engaging with them gives me great joy. I think you have the grounds to make a very happy husky...just thoroughly consider the off-leash stuff. Even ON his trolley, Ami killed a rabid raccoon this summer and had to be on "house-arrest" for 45 days for observation. I totally agree with you Amy. My parents own Brittany Spaniels. Great dogs. Extremely loving, biddable and friendly. But I would never own one as a first choice. I need more in a dog than just a dopey, follow me around and flop on the couch with me whenever I want. I love having a dog that challenges me (though frustrating at times) and has such a strong personality. I see many people gave you great responses, and i did not read them all till the end but think i have a good suggestion. Does it have to be a puppy? Why not look into adopting a "senior" husky, one that might be less prone to common husky traits due to age, that is just looking for a loving home to hang out with there human? i also know that "senior" is a loose term, we have our girl that is about to turn 12 and well some days she is a bigger PIA then our 7yr old male. She still hikes with me up to about 5-6 miles and is spunky. Don't let age full you with this breed. We get a few in our rescue over the yr and they make great pets for "older" people (read that loosely) Amy who commented here is quite active with her boy Ami! any ways its just a thought. Yup. I can face plant with the best of them! And Ami was a rescue... we adore him and he adds great joy to our life! I didnt read the whole thread but just wanted to tell you some of kodas experiences. I take him to a baseball field by my house. Part of the fence is only 3 foot high. He does not jump it. I know he can. But he never tries even when there is something excting on the other side. I never really purposely tried him off leash. He ran out of his kennel once and ran around the front yard. He wouldnt stop so i yelled "do you want i banana" and he ran right to the front porch. So no i dont trust him off leash but if a accident happens i have a few tricks to get him safe. As for kennel, he has a kennel where he can run inside the garage our outside to the 4' fence. (Actualy in process of finishing brand new kennel for him with 6' fence). He goes in there when im at work or school. If its super cold or super hot i leave him kn my bedroom and he is fine. Hope this helps. Completely agree with Jen and Ami about the advantages of an older dog. I got my my first two huskies as puppies. I had to endure classic tales of home destruction until about age three. My current husky, Bodhi, was a rehome that I got at 17 months. He was already crate trained, which is so wonderful I can't believe I didn't stick to my guns with the first two. And while he was destructive at first, it was for a much shorter time, since he was older. Once we had the kennel fortified, he couldn't destroy the house when we were gone. He couldn't escape, because the kennel's six foot walls were covered; there was a double lock on the door, and the floor was a cement pad. Now at age 5, Bodhi isn't destructive and has free roam of the house when we are gone. Check with local breeders or rescues for suitable dogs and do your homework- some dogs are returned because the first human was inept, others because the dog has probs. 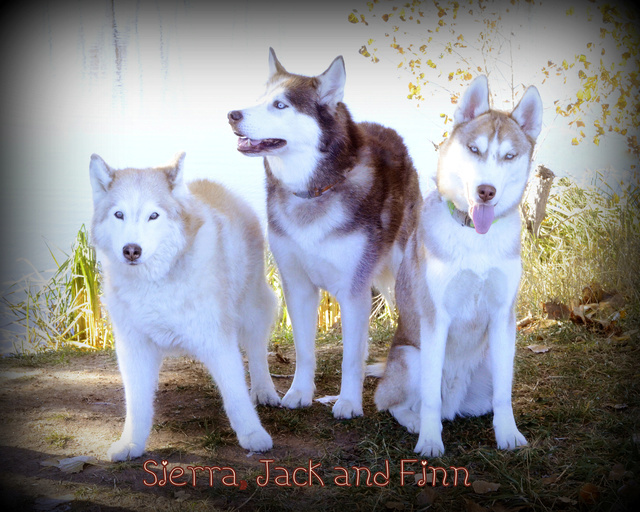 I want to thank all you fine Husky lovers that contributed to this thread and to the principals of this forum for providing such an excellent resource. With everything I've read here & elsewhere, I've been able to come to decision. Being that I'm still apprehensive about Husky ownership, as well as dedicating the energy that would very likely be required in properly training/raising the dog, I've decided to pass. Probably the most beautiful in existence, but probably just not for me. I'm sure glad I did my research prior to diving in. You've all been a great help and I thank you very much. I wish you & your dog very fulfilling lives together.